We have got a new batch of fresh-faced Eco reps ready to get going on some exciting projects. We have added their names below! Also, our new green bin for the playground is due to appear in the coming days. This bin will be for food waste only and will allow our reps, along with Mr Pearce and Mrs O'Sullivan, to look at how much we are throwing away. The food waste, for now, will be going into our composters to help the environmental effort. Sustainability and being ‘eco’ is becoming an increasing focus at Thames Ditton Junior School, as the need to be more environmental friendly becomes more important. To make sure we are playing our part, we have a committee of children (two from each class) who take an active lead in our work and initiatives. At TDJS, we are proud to have an eco committee made up of staff and students, committed to promoting awareness and modelling a 'green' approach. The committee is made up of two children from each class (Year 3 - 6) and is led by Mr Pearce. All of the members are part of the committee for at least half an academic year. The committee meet at least once a month to discuss their ideas, monitor how the school is using energy and its resources, looking at current news stories about the environment and taking part in initiatives in our local area and nationally. Away from these meetings, children feedback to their classes, encourage their peers to take an active interest and promote their ‘green’ mentality throughout the school and the community. In 2016, our school’s ‘Eco Code’ was updated for the second time. The pledge is shared with all staff and students to try and promote a consistent approach to our effort across the school. - put our rubbish in the correct bins. - walk to school when we can. - look after our environment. - use resources wisely and carefully. - save electricity and water whenever we can. - remember that this is everyone's responsibility. For his latest assembly, Mr Pearce taught us all about the very topical problem of rubbish in our school, the UK and across the world. He shared some ideas about how we can recycle plastics, keep our playground tidy and what goes in which bin in school and at home. We even watched a video about a man who made his own castle out of 40,000 plastic bottles! Hopefully, the assembly has inspired you all to do your bit in recycling rubbish and being more aware on what packaging your products have. Not even freezing temperatures can stop our excellent Eco Committee from raising money for our school's Eco Fund! A number of our reps battled the elements to sell some brilliant 'green' themed cakes and make over £150. The money will go towards our efforts to help the school's eco efforts and the wider environment. A big thanks to everyone who made, sold or ate cakes! A big thank you to everybody for their efforts on Green Day, especially the super Eco Team! 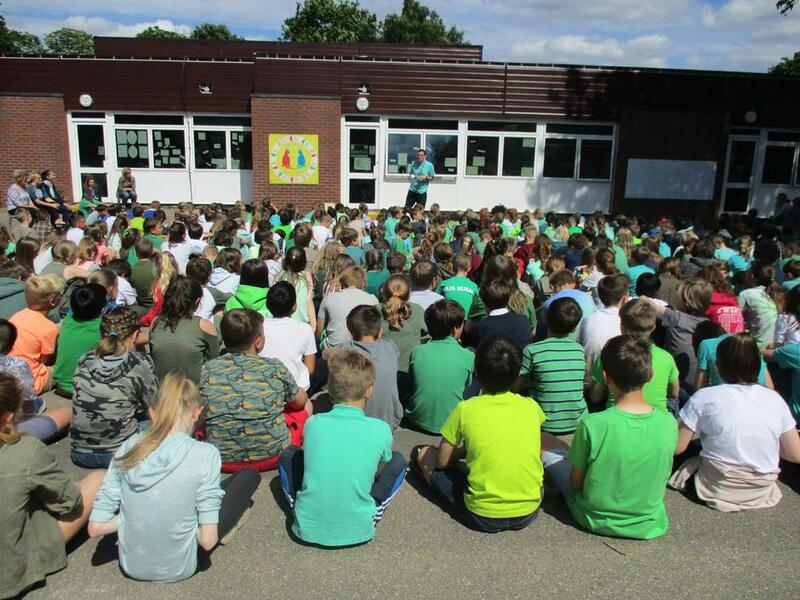 We managed to raise around £300 from our mufti collection, cut our energy use by 60% in the 'No Power Hour' and enjoyed a sunny assembly on the playground at the end of the day. Keep your eyes peeled for some photographs from the day on the website, in the newsletter and in July's edition of 'About Thames Ditton'. If you forgot your £1 donation for the mufti, please bring it in as soon as you can. Help sort out the recycling in your home. Remember to turn off lights and taps when they are not being used. Encourage your family to walk more, especially on local journeys. Eating all of your dinner; remember food waste isn’t very green! Buy energy efficient products, such as light bulbs. Make sure you don’t drop litter at home or when out and about. Talk with your parents about being more environmentally friendly.